This brochure is intended to be a basic handout to describe Dual Recovery Anonymous. It includes, The Twelve Steps and Twelve Traditions of DRA, The Preamble, , selections from the DRA Questions & Answers fact sheet, and contact information. It is designed to print out onto both sides of a single standard sheet of paper in landscape mode and then be folded into thirds. This makes it an economical and convenient way to distribute quite a bit of information to newcomers and other interested parties. To view or print this tri-fold, you will need to have the Adobe Acrobat Reader software installed on your computer. Make sure your printer is set up to print in landscape mode, select and print the first page, and then feed it back through your printer with the second page selected. This may take a couple tries to perfect. Please make sure any other printer settings such as "print to fit page" are deselected and that any page margin settings are no more than .6 of an inch. It is also important to note that many commercial printers and quick print facilities can now print directly from these PDF files. This pamphlet is still up for review and its content may soon be modified. We are just starting the process of making a series of various topic pamphlets available and welcome any feedback from our members on what subjects you would like to see covered, if you are able to print and fold these pamphlets, and if the imaging and layout remain useful when printed on your various computer systems and printers at home. These tri-fold series pamphlets available in quantities through the DRA Online Bookstore. To download the pdf reader software, return to the Download page and follow the directions. Here is a version of the above that has the Steps on the back and nothing on the inside. It is meant to be printed and used as a template. You can put your Group's meeting schedules or current events on the inside utilizing whatever software you have available. 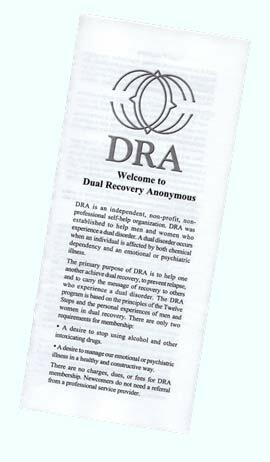 The "Welcome to DRA" tri-fold pamphlet is copyright protected by DRA World Network Inc., and is not in the public domain. The DRA Crest logo is Trademark protected by DRA World Network Inc., and is not in the public domain.